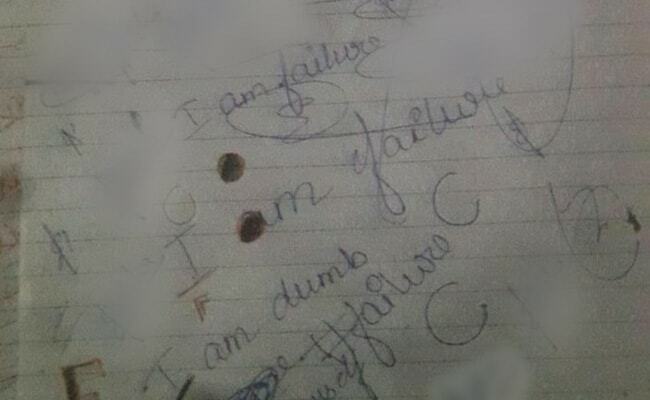 Class 9 Noida Student Suicide: Note Found At Home Says "I Am Failure"
While the phrase "I am dumb" has been mentioned once in a note found at the home of the Class 9 student who committed suicide, a diagonal line towards the bottom of the page says "I hate myself"
Noida/New Delhi: A notebook seized by the police from a Class 9 student's study table at her home could provide vital clues to the teenager's death, including what she felt about herself. The 15-year-old was found hanging from the ceiling fan of her room at her home in Noida on Tuesday evening. Her parents have accused two of her teachers of sexually harassing her and deliberately failing her in her annual exams. "I am failure" has been scribbled twice on one of the pages of the note book. Police and the girl's family have confirmed that it is the girl's handwriting. While the phrase "I am dumb" has been mentioned once, a diagonal line towards the bottom of the page says "I hate myself". The page also bears multiple signatures of the teen. The girl's father told the police that she had complained of two teachers -- who teach science and social science -- sexually harassing her, and that they would fail her in her exams. "She told me her SST teachers had touched her inappropriately but I said since I'm also a teacher I can say they can't do it. It may have been a mistake but she said, she's scared of them and no matter how well she writes, they'll fail her,' said the devastated father. The First Information Report (FIR) mentions the names of the two teachers of a private school in which the girl studied. 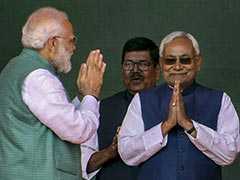 "The father has alleged that the girl was harassed by two school teachers who failed her in the exams, intentionally. Cases have been registered under child sexual abuse laws and abetment of suicide; and further investigations are underway," said Arun K Singh, SP City, Noida. But the school's principal has denied allegations of sexual harassment. "It is an unfortunate incident. The school has been following promotion policies of the CBSE. Let me make it clear that she had not failed, a re-test was scheduled," claimed the principal of the school who also said authorities will cooperate with investigators. The girl's re-test was due on March 23. The teenager's parents had gone out yesterday and she was alone at home. When they returned a couple of hours later, around 6 pm, they found the girl's room locked. On breaking open the door, they found her hanging. The girl's family took her to hospital but doctors could not revive her. The girl was a good Kathak dancer and was training in classical dance, her family said.